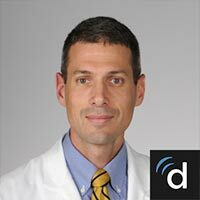 Dr. Chadrick Denlinger is a cardiothoracic surgeon with an expertise in pleural mesothelioma at the esteemed Hollings Cancer Center at the Medical University of South Carolina (MUSC). He also is the surgical director of the MUSC Lung Transplant Program, which is part of a comprehensive multi-organ transplant center that has earned national acclaim for its wide-ranging ability to restart people’s lives. On cases of mesothelioma, Denlinger works closely with medical oncologists, pulmonologists and radiologists who have vast experience in treating this rare cancer. He often consults with thoracic surgeon Dr. Barry Gibney, who had experience in pleural mesothelioma before joining the Hollings Cancer Center in 2017. Denlinger’s clinical interests include lung cancer, transplants, advanced diseases of the lung, mesothelioma, sarcoma, esophageal cancer and gastroesophageal reflux disease. He does minimally invasive thoracic surgery, which often shortens recovery time and hospital stays. He is part of a multidisciplinary tumor board at Hollings that meets regularly to discuss each thoracic oncology case, making sure every patient’s care is individualized. He spends considerable time with patients, explaining the diagnosis, and what the treatment options are. Although the majority of mesothelioma patients do not qualify for aggressive surgery — the disease is often too advanced — some decide to try a multimodal approach that includes chemotherapy and radiation in addition to surgery. MUSC is the only lung transplant program in the state and the largest academic cancer center in South Carolina, offering a wide range of services and a well-schooled staff dedicated to the best possible care. “The most important part of that team is the patient and his or her family,” he said. Denlinger also works alongside physicians trained in a variety of other advanced lung diseases, including emphysema, cystic fibrosis and pulmonary hypertension. He graduated from The Ohio State University College of Medicine and followed with fellowships at Washington University in St. Louis and at the University of Virginia. Denlinger belongs to The Cardiothoracic Surgery Network, the Southern Thoracic Surgical Association, the Society of Thoracic Surgeons and the Thoracic Surgery Directors Association. Disclaimer: Dr. Chadrick Denlinger has no professional affiliation with Asbestos.com. MUSC Health. Doctor/Provider Directory. (n.d.). Chadrick E. Denlinger, M.D.